As I accompany my canine partner to meet and visit with new and known friends at the Dove House, there’s not a time that I haven’t looked up and given thanks for the opportunity to just be there. After every visit, I give a big hug and warm, heartfelt “thank you” to my pup for just being her. She is an angel dressed in her fluffy, soft, fur coat no matter what the local weather forecast. She is there to ‘be’ and ‘be with you’. Since every visit is very personal and I’m simply the observer, I will try to share with you my experiences through words, which is a difficult task because I’m trying to translate the tiny miracles I see happen by just ‘being’. Whenever we visit, as the human guide, I tend to be parochial and functional in my activities. I greet the staff at the front door and head to the volunteer desk to sign us in and see the patient census. From canine eyes, my pup is scanning for the 1st person she sees to approach and ‘say hello’ canine style. She pulls her ears back, squints those baby blues, tucks and swags her fluffy tail and smiles as she’s pet and greeted by the human. As I’m taking care of the administrative requirements, my pup smells the flower arrangement, looking for humans to interact with and faces toward the patient rooms and nursing station. As we proceed down the hall she’ll head for a room and I will let her know we have to ask before we visit. She happily trots to the nursing station where there is always a gentle soul ready to smile and pet her while they compliment her. She will look at me at just smile as I brag about her but she’s on the lookout for the staff member coming down the hall with the restock cart. She looks in that direction, as if she’s says, let’s go, my turn to share my perspective on puppy love! Off we go to greet the staff member who beams and she has a few moments of joy visiting with the pup. Depending on the circumstances, sometimes she’ll do tricks for the staff and my pup focuses on them so for that moment in time, the connection is clearly between the two care-givers, pure unconditional love. From where I’m standing, around 5’3, it’s exhilarating! We all get a minor energy feel-good boost, those endorphins are 100% all natural, no bi-products or artificial ingredients! As soon as the staff lets us know what rooms to visit, we approach the door and I will ask if they would like a visit from the pet therapy dog. As soon as we hear YES, we proceed in and she decides the order, it’s usually very methodical and she visits everyone in the room. If the human is putting off a ‘no thank you’, my pup will look and proceed to the next human. She always approaches the patient in the bed and will put her head where they can pet her easily. Sometimes she’ll concentrate on the family member by the bedside or one clear across the room sitting quietly. As long as there’s no objection from the human, I let my pup follow her intuition and reach out to the humans as only a canine is capable. No words, no inhibitions and no judgments. If the human is not engaging, sometimes she’ll stay close but not interact. Sometimes she’ll look at wag until the human breaks the silence with a sigh or a gesture or a tear, and then she’ll come close to share the power of touch. 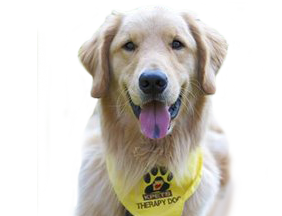 The therapeutic value in a petting behavior seems to have a calming effect on both human and canine. This is especially intense when seen by patients under sedation or with brain injuries and where puppy patience is priceless! Since we encounter family members, my pup is able to elicit stories about family dogs or humorous stories related to the family member and a dog. We have been privileged to be present as a loved one died and ‘be’ with the family as the deceased family member was being transported to the funeral home. My pup functioned as a distraction capable of taking the human mentally away from an awkward situation for a moment of non-structured time with an emotional sense of relief. One family approached us with some rather mixed emotions and hesitations. The family included, a mother, father and older teenage daughter. The mother stated she was afraid of ‘big dogs’ and the daughter exclaimed that my pup was her ‘favorite breed’! The father stood close to his wife and appeared to enjoy my pup and remarked what dogs he had as a child. My pup visited the daughter with pep in her step but sat beside the mother and slowly looked up at her and waged her tail as the mother pet her for several minutes remarking how gentle and sweet she is for a ‘big dog’. Then the father knelled down and hugged my pup for a minute of emotional bonding. Dispelling those ‘big dog’ misconceptions is part of our duty. Dogs are like humans, no two are alike; some are good communicators, others lack the skills; and some exhibit socially unacceptable behaviors while others are noble members of society. Besides, we all experience times that we just don’t reflect our normal disposition and that anomaly is an unpredictable reality. The children are excited to see the pup and enjoy seeing the tricks she performs. My pup really enjoys working with children and will listen to them when they ask her to perform tricks. The grandson of one patient met my pup and he watched her do tricks and laughed. He enjoyed the time so much that he found her walking down the hall and came to us and told me he wanted to have his ‘new friend’ do some tricks. Needless to say, she was thrilled to see him seek us out and she responded in kind like his new BCFF (Best Canine Friend Forever)! She has enabled countless children and adults to relieve themselves of fear of dogs from just ‘being’ with them for a few minutes. She has learned to look and smile at the camera and has found her way onto many iphones, sometimes solo, but usually with the new BHFF (Best Human Friend Forever) beside her. It doesn’t matter how long the interaction lasts, it’s about that connection that happens, which imprints the human heart with the message, ‘YOU are Worthy of Unconditional Love’. This is not a tangible good or something you can buy, it’s an emotional experience that can happen when you least expect it through means you least expect. My pup knows no boundaries with her love and respects those disinterested in her presence. She never displays dissatisfaction or disapproval; she is simply happy and friendly and loves to ‘be’. Since stress is invisible to the human eye but we can feel the presence all around us, my canine is very sensitive to positive and negative stress. Sometimes she’ll tell me it’s time to go- now. I trust her and listen to her when she gives me the ques. My pup doesn’t come with the human bias that shrouds me. I may think a person is quiet because they need privacy whereas she may understand through canine, unspoken language, that it’s time to sit and wait. I may think someone wants us to relax and stay, while she understands they’re tired and the visit is over with that person and it’s time to go visit someone else. I marvel and humble myself when I acknowledge that she is a brilliant communicator and never says a word! Every day presents a new opportunity to meet a new friend and strengthen our established friendships. Our time is spent being there and saying so much by saying virtually nothing at all. Regardless of role or station in life, we invite new experiences by visiting everyone in our path and all those kind enough to allow us the privilege to walk on their path, even for a brief moment in time. As an educated adult, I can only say, no academic training has equipped me with the ability to understand the wisdom of just ‘being’, wheras this is a natural talent for my pup. I have been blessed with the opportunity to devote myself to the stewardship of volunteerism and be the designated driver for my pet therapy dog who performs tiny miracles every day. Touching lives one paw at a time, never speaking a single word, yet leaving profound, everlasting memories in the hearts of those she meets.